Disguised as "Cousin Sid," Tom helps Huck to free Jim in an elaborate, hilarious prison break. In Chapter 42--after surviving a gunshot to the calf--Tom also resolves the central conflict of the book: Jim's struggle to attain freedom. In your final 100-word essay, discuss Tom's contribution to Jim's escape and, ultimately, Jim's freedom. Did Tom Sawyer end up helping Huck & Jim or hurting them? Use details and quotes from the book to support your answer. Tom Sawyer is an adventurous boy, who doesn't really care about consequences. Even though Tom knew that Mrs. Watson stated in her will that Jim would become free when she died, and she did die, Tom decided it would be hilarious and fun to have Jim, a captive, and create escape plans for him. That is such a cruel and cold-hearted thing to do; Jim wants to find his family, and nothing should keep him from doing that. He was treated badly; he was tied in chains. There is line between playing a joke on someone, and then just flat out being a jerk. Tom definitely crossed that line. Personally, I believe Tom deserved the bullet in the leg. He only made Jim's tough life, tougher. I think Tom Sawyer only ended up hurting them in the end, because he knew Jim was free the whole time but never told him till the end when Jim almost got punished. Tom just decided to take things into his own hands and make Jim's rescue a long draw out process by: putting the rats and snakes in the shed to make the dungeon more realistic, making him use his blood to right on t-shirts, and stealing things from Aunt Sally. If Tom would've just told Huck and Aunt Sally from the beginning that Jim was free than he they could've prevented all the farmers getting together to case after the "Indians" and Jim, Aunt Sally wouldn't have been so scared when she found out the boy's were missing the next day, and Tom wouldn't have been shot in the leg. But Jim like always saved the day and his reward I guess you could say was being set free in Mrs. Watson will. In these last few chapters, Tom Sawyer seems to be just as adventurous as in the beginning of the book. Huck and him went through much trouble trying to free Jim; like: lying about who they were, Aunt Sally's spoons that they took (which she didn't realize), and everything else they 'took'. Both Huck and Tom came up with clevor plans to free Jim from the Phelpes's house. One being the witch pie, which Tom planned to bake a rope ladder in the pie. Tom and Huck ended up succeeding at freeing Jim; and overall, I believe Tom definitely ended up helping both Huck and Jim. What Tom, or "Sid" to Aunt Sally, did to Jim was evil. He was playing a game with a human beings life. Trying to simulate a fairytale that happened in a book. He made Huck and Jim do so many useless things just so he could be satisfied and have some fun. He made Huck "Borrow" things from Aunt Sally for example: a sheet, shirt, candle, and spoons. He also made him help dig a tunnel with a knife so Jim could tunnel out-even though they could of easily walk out the front door. They baked a rope ladder into a pie, with it not having any use in the escape. While they were going through all these shenanigans it made the Aunt and Uncle suspicious and they ended up telling the locals. They gathered up by the house one night, and made the escape very difficult and dangerous. Tom got shot and thought it was cool, it made him feel like a character in one of his books. While reading this it made me hate Tom, and once I found out that Jim was free in Miss Watson will I wished that the bullet wound would of killed him. Sure he save Jim's life, but it should of never of been in danger. The little know it all didn't really hurt Huck or Jim it actually helped them. The way he went about doing it was uncalled for and selfish. I 100% believe Tom Sawyer helped Huck and Jim. In chapter 42, Tom reveals that Jim has been free ever since Miss Watson died. Miss Watson felt so ashamed of putting Jim on sale, so she decided to five him freedom. Therefore, if it wasnt for Tom, Jim would of never known of his freedom. But, i do think Tom did the wrong thing by breaking Jim out of jail. My conclusion is that Tom did hurt them at some point of the story, but at the end he was the hero for letting everyone know about Jim freedom. So, Tom helped Huck and Jim at the end. Hucks original plan was to simply steal the key to the shed and sneak off with Jim at night. Only Tom wanted to make the plan a little more creative. Ex being: digging him out with forks and spoons. The night they planned to free Jim, all of the family was armed and prepared to fight, scared by all of the letters left by "robbers". Tom was shot in the calf in mid escape; Tom suggest Huck leave him but Huck got a doctor led him to Tom blindfolded and alone. They then return to the house revealing their true identities, which leads to Jim being chained up back in the shed, in the end, Jim was set free for helping the doctor nurse Tom to health. But to answer your question "Did Tom Sawyer end up helping Huck and Jim or hurting them?".. in the long run, I'm going to have to say no, he was of no help at all. For Miss Watson had already freed Jim in her will where Tom also reveals to Jim that he just wanted an adventure out of the situation and offered him forty dollars for his patience and says he will send him back as a hero giving him a reception with a marching band. I believe Tom Sawyer unintentionally helped a drunk father’s son and a black slave create a bond more powerful than a friendship could ever hold. Huck would trade his life and reputation for Jim, but the thoughts of a worthless boy haunts him forevermore. Huck sees Tom’s life as worth something more than that and believes that Tom has something to lose by helping him free Jim. Even through brash and boldness, Tom encourages Huck of a dangerous plan to free Jim which could kill all three of them. But alas Huck says, “Tom told me what his plan was, and I see in a minute it was worth fifteen of mine for style, and would make Jim just as free a man as mine would, and maybe get us all killed besides. So I was satisfied, and said we would waltz in on it." It seems in countless ways that Huck forgets many of the lessons he has learned with Jim on the raft. In a sense, Tom and Huck descend to the level of those who own or trade slaves. They almost become a mirror image of Aunt Sally and Uncle Silas, who are slave owners themselves but frequently visit and pray with Jim. Towards the finale of Huckleberry Finn, Tom reveals to be even more manipulative than we realized. The bullet in Tom’s leg seems rather deserved when he enlightens everyone that he has known all along that Miss Watson has been dead for two months and that she freed Jim in her will. Tom’s confession ignites a new depth of cruelty. He only sees life as a game and the people in it as play things. Jim has, unknowingly, been a free man almost the entire time. All of Huck’s morals, lies, and outbreaks of society, have been part of a great ‘adventure’. But because of Tom’s manipulations, Huck and Jim became closer by overcoming those obstacles and challenges they faced within the journey. Whether it was testing Huck’s loyalty to Jim or even Jim’s trust towards Huck. We learn that not everybody liked Tom Sawyer but his importance was of great opportunity and fun. And in the end, Huck and Jim were heroes in each other’s eyes. Tom Sawyer is a person who does what he wants because he is a charlatan. At the beginning of Huck Finn he was introduced as the head of the group he established with Huck and his friends. He will always be the leader; he chooses what happens and when it happens. When Huck finds out the dauphin sold Jim he writes to Miss Watson but then realizes he can not send it and he would rather just go to hell. He finds the Phelp's house where Jim is being held, and Sally is convinced he is Tom Sawyer. When Tom arrives Huck gets to him first to tell him what is happening so Tom introduces himself to his own family as William Thompson. Tom agreed to Huck very quickly that he would help free Jim which seemed a little odd for Tom to agree so quickly. When they found where Jim is staying, they went to him and Tom explains his elaborate plan to get him out when it would only take a few tricks here and there. Instead of going about it Huck's way, they HAD to go with Tom's plan because "he read it in the books". I feel like Huck knows in his heart Tom is only doing this for the adventure and does not realize the danger he is putting everyone in and doesn't see the big picture. Even Jim is confused to why the break out has to involve so many obstacles but he agrees to go along with it. When Tom writes letters to Sally and Silias, local farmers actually show up to the house and attack the shed. Jim, Hick, and Tom all try to escape through a hole in the wall, thus getting Tom shot. Jim tells Huck and Tom that he needs to see a doctor so Tom went into town while Jim waited. 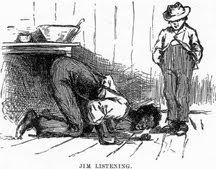 When the question, did Tom Sawyer end up helping Huck and Jim or hurting them is asked, I would reply that he hurt Huck and Jim. If it were not for Tom, Jim and Huck most likely would have never been in so much trouble or had to go through so much. Huck had an easy plan to get Jim out but Tom had to be the leader and do it his way once again. I am not sure if this taught Tom a lesson or not, but I know it helped Huck mature even more and made him really appreciate Jim. Tom hurt Jim and Huck, but at the same time he helped him. He hurt them by making a ridiculous escape plan. It was completely unnecessary. He could have gotten them all killed. They could have easily gotten Jim out of the cabin through the window and not have gotten caught. Tom helped Jim by telling Aunt Sally and Uncle Silas how Jim helped doctor his bullet wound. Jim was rewarded for that or as the book says "treated like a king". Then Tom said that Miss Watson had set Jim free. That got him his freedom. In a way that hurt Jim, though, because Tom knew all along. If he had told they wouldn't have even had to try to steal Jim. I think Tom hurt them more than helped them. I think Tom Sawyer helped them. He helped them in alot of ways. Not really helping like lending a hand but helping like completing the other half of Huck. They are very different people. Although Huck wants to be like Jim he has more of a rational way of looking at life. Tom likes to stick to the rules and Huck like to question authority and think for himself. Tom has a very wild scheme to things whereas Huck does not. They seem very opposite to me. But in my opinion, Tom helps huck by the simple fact that he completes him. I think that he ended up helping them. Tom did try and help Huck find a way for Jim to escape. One of their plans was baking a pie and putting a ladder in it. That way Jim could recieve the pie and get a ladder without the guards knowing about it. Also, Tom helps them by coming up with some good plans for Jim's escape. Even though Jim was already free, Tom still tried to let Huck feel good about bailing Jim out of jail. Jim did not know about it either until he was out. But him escaping would only lead Jim and Huck to run more. Just like what they were doing during the whole book. Aunt Sally finds Huck who she thinks is Tom, her nephew. Huck meets Tom's wagon down the road and Tom thinks that Huck is a ghost- because he thought he was murdered in St. Petersburg- then he is convinced Huck is alive. Huck is surprised that Tom is willing to help him free Jim. Tom introduces himself as William Thompson to Aunt Sally and Uncle Silas. Sally thinks her own nephew is an impolite stranger. Tom realizes that Jim is being held in a shed. Huck's plan is to steal the key and be off with Jim that night but Tom comes up with a wild plan that could get all three of them killed. Tom is sacrificing his reputation by helping a slave escape. So Huck and Tom do all of these things to help get Jim out including: sawing Jim's chain off, sawing Jim's leg off, but they are pressed for time so they will dig Jim out with table knives. Tom just sees this as an opportunity for fun and adventure when he is actually being cruel towards Jim by putting mice in the shed with him (which got in Sally and Silas's house as well)and making him suffer by waiting in there all that time. Aunt Sally and Uncle Silas are startled over the mysterious letter so farmers gathered in the front room with guns. When Huck saw them, he went to the shed to warn Jim and Tom and then the men attack the shed. Jim, Huck, and Tom escape through a hole in the wall, but Tom makes a noise so the men start firing shots, and Tom gets shot in the calf. Huck, Tom, and Jim row over to their raft and Huck finds a doctor. The doctor tells the crowd that Jim sacrificed his freedom to help nurse Tom. Tom was gonna repay Jim by sending him back as a hero, with a reception and a marching band. He also gives him forty dollars. Tom was trying to help free Jim the whole time and in the end we find out that Tom was cruel and manipulative because he already knew Jim was a free slave two months back because that was when Miss Watson died and she freed Jim in her will. I believe that the "respectable" Tom Sawyer actually ended up hurting Huck and Jim. His foolish actions almost got them all killed! The fact that Tom knew the whole time that Jim was a free man, yet still tried to do all of the foolish things to "free" him, such as saying that "they must saw Jim’s chain off instead of just lifting it off the bed’s framework, because that’s how it’s done in all the books." It ended up with Tom getting shot in the leg, and having his reputation ruined. With that being said, Jim did end up free and Huck did end up un-harmed; but Tom's actions still could have potentially ended all three of their lives. I believe that he helped Huck and Jim. In the end everything had a fairytale ending. Jim was free, Huck was happy, and Tom made a full recovery from his wound. Tom taught Huck to be courageous and to look and situations differently. Tom made out an elaborate and heroic scheme on how to free Jim, and even though it almost got them all killed, it all worked out good in the end. Tom also treated Jim like a king after he was free by giving him the 40 dollars and getting him dressed nicely. This shows that Huck and Tom both learned to accept people for who they are, not by the skin color. When the boys realize that Jim is imprisoned in the hut, Huck can only concentrate on freeing him where as Tom wants to create an elaborate scheme to free Jim. Unfortunately for Huck when Tom is involved he seems to lose his sense of self, going along with Tom's scheme which prolongs Jim's suffering. Tom Sawyer's sensibilities are founded in the illusion of what is moral and right. For example, Tom insists that Huck pay for the watermelon he stole but feels nothing knowing his 'game' is prolonging Jim's capture. In the long run I feel like Tom actually ended up hurting Huck and Jim because he brought the bad side back out of Huck and prolonged Jim's freedom. I believe that Tom Sawyer overall helped Huck free Jim. In his mind, Tom thought that he was helping Huck and Jim. Although when reading, instead of staying simple and sticking with the objective of freeing Jim, he decides they should go on a crazy expedition to free Jim. One example is that Tom says, "we have to create our own obstacles." A couple of those "obstacles" were sawing the chain off Jim instead of just taking them off, and a rope later. If Tom would of stuck to the simple version of setting Jim free, then there would have been no doubt that Tom was helping Huck and Jim. I think Tom Sawyer hurt Huck and Jim in the long run by all his actions. He held the information to Jim's freedom secretly. And only told the truth finally when he was struck by the militia men. When Jim was told by tom he then could finish school like he had dreamed off forever. Tom not only held Jim from freedom but from schooling at a University and starting a life and not being a slave. He definately held out on Jim beginning a life when he finally came clean about Miss Watson's will. My Opinion of Tom is that he is a boy that will never become a man. He obviously does not have any respect for Jim. Putting Jim through his elaborate escape plan was all for his own enjoyment, the fact that Mrs. Watson had freed Jim two months prior meant nothing to him. He wanted to live out his fantasy in the way he envisioned it should play out, so the bullet in his calf was much deserved. Sadly I do not believe Tom will learn anything from it. So ultimately I have to say Tom comes out with no respect and he ultimately hurt them because so much of what happened could have been avoided if it had not been for Tom.